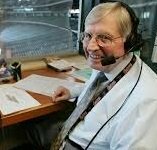 September 17, 2015 - Milo Hamilton, ASA Lifetime Member and legendary broadcaster known for his call of Hank Aaron’s record breaking 715th home run in 1974, has died. He was 88. In making the announcement, Lou Schwartz, ASA President, said, "Not only has the sportscasting world lost a legend, but the ASA and I have lost a dear friend." An Iowa native, Hamilton got his first taste of broadcasting on the Armed Forces Radio Network while serving in the Navy during World War II. He went on to attend the University of Iowa and secured his first big league job in 1953 with the St. Louis Browns of the American League. “... He's sittin' on 714... Here's the pitch by Downing... swinging... there's a drive into left-center field... that ball is gonna be... OUTTA HERE! IT'S GONE! IT'S 715! There's a new home run champion of all time... and it's HENRY AARON!" In 1985, Hamilton joined the Houston Astros where he enjoyed his longest tenure as an announcer, serving as the team’s No.1 play-by-play voice from 1987 until his retirement in 2012. Among his many honors, Hamilton received the 1992 Ford C. Frick Award from the Baseball Hall of Fame, was inducted into the National Radio Hall of Fame in 2000, and had a street named after him in downtown Houston in 2009.